The Okame Cherry tree, Prunus Okame, is one of the earliest of the flowering cherries. Its carmine-pink petals, with rose-red calyx and reddish flower stalks, open fully before leaf break. It has a very consistent year-to-year blooming habit. The rosy red buds are attractive before flower break and the overall floral effect lasts 2 to 3 weeks. At maturity,  Okame Cherry trees will attain 20-30' in height with a similar spread. The young trees display a broad-columnar habit; older trees develop a more rounded habit. Fruits are small, and not ornamentally important. This deciduous tree has an attractive dark red-orange fall color. Shiny reddish brown bark is also very attractive. Rate of growth is medium-fast, especially when young, so expect 1-2' or more per year. Prunus.  Okame does best in moist, well-drained soil, but will adapt to a variety of soils as long as they are not wet. It is pH adaptable. Locate it in full sun or light shade. 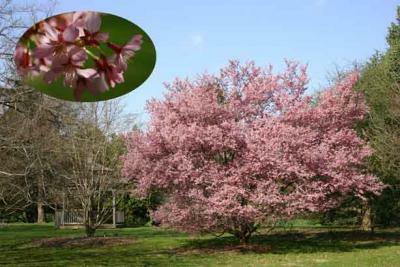 It makes a fine specimen tree and should be sited where it can be easily seen in late winter/early spring. Flowering is its main feature, yet the  Okame can be considered an all seasons plant with its attractive bark and fall color. Excellent heat and cold tolerance.